Mold removal is still a necessity for new construction projects. From residential builds to commercial development, mold spores can hatch and spread in the blink of an eye. As you know, the mold is a fungus that grows on rotting substances. It is usually detectable by its greenish-yellowish color — but can form in other colors as well. Mold can be found in literally every environment — especially indoors and outdoors. Spores grow due to warm, arid and humid conditions. Similarly, they can grow in areas that are damp, such as basements, crawlspaces, and attics. With this in mind, even the newest reconstruction or remodeling can result in mold being present — and professional mold removal specialists should be contacted to deal with them. Mold can emit a foul odor at times –but for the most part –is odorless. This is what makes these spores so dangerous, as well as causing nasal stuffiness and throat irritation. Mold is also known to cause respiratory illnesses and breathing problems in both humans and pets. Similarly, it can result in skin irritation and several allergic reactions in some individuals. 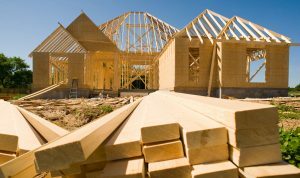 If you are working on a new construction project (residential or commercial), it is vital to wear goggles, nose masks, mouth masks and protective gloves. This will help prevent any direct contact with the mold while avoiding health problems and issues. However, mold can still be present in all types of properties year round. 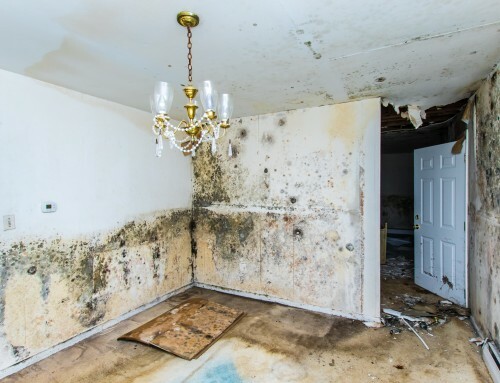 This is why a mold removal and remediation expert is highly recommended to handle these issues. • If the mold is less than 3×3 patch size, you can use strong bleach and water. Use protective gloves and apply the bleach and water to the mold. You can scrub the area in question if desired –but let it dry completely in order to secure timely results. • Mold spores can also be handled with ammonia and water. Ammonia may be tough to smell but it does have essential ingredients that loosen mold spores. Similarly, there are commercial disinfectants you can use on the mold as well. • One of the best ways is to use bleach and water on a mop. Simply mix the two elements and dip your mop in the bucket. Apply as evenly as possible so you can tackle surface — and below the surface — mold spores and growths. • If you spot mold on walls, Sheetrock, or insides closets and bathrooms — vinegar is also a great solution for mold removal. In fact, distilled vinegar is cost- effective and can easily be poured into spray bottles. You can then spray the vinegar onto the areas with mold –and let them sit for an hour or so. After an hour, wipe the area clean with water and allow the surface to dry. 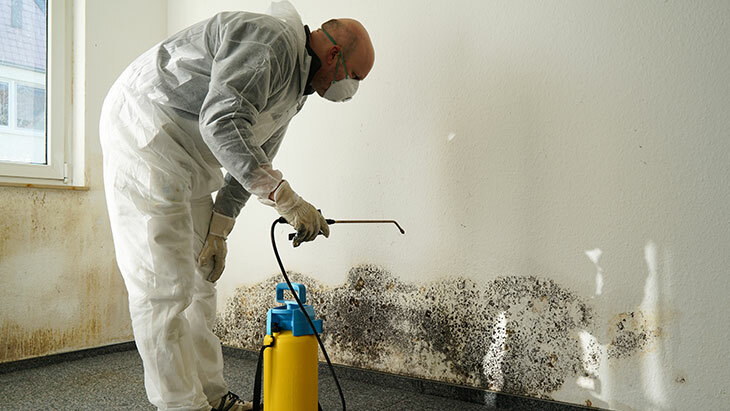 Mold removal professionals are always available for all types of construction. In fact, they offer pre-mold inspections for commercial and residential establishments. Similarly, the offer complete mold detection and removal services — for all properties –across the board. This includes mold removal from closets, walls, Sheetrock, basements, attics, and crawlspaces. • Identify the source of the mold on your property. This includes high-end detection equipment, along with visual sources. Professionals also analyze and assess the mold to see if it’s due to excessive moisture in the home or business. With the latter, they can recommend the best steps to controlling moisture levels in the property. • Mold remediation plans may include cleaning and disinfecting the affected areas, along with the removal of certain Sheetrock and contaminated areas. Experts will connect you with the best local contractors for these jobs. • Mold cleanup services also include cleaning the areas with industry solutions, as well as industrial-strength vacuums. As always, all contaminated areas will be isolated and all removed items will be placed in bags for safe and environmentally-friendly disposal. These are but some of the services that mold removal technicians offer. For a more detailed breakdown of services, simply check the Web or contact your local mold remediation company or contractor today. January 21, 2018 November 29, 2018 Mold TopicsLeave a Comment on Can You Make Your Home Resistant To Mold? It’s a nightmare no homeowner wants to deal with — having mold in your home not only creates unpleasant odors, but it also presents a health risk for the inhabitants. The latter can be a huge problem if an allergic individual happens to be living in your home. And it doesn’t stop there; besides paying for mold removal, you might also have to foot additional costs in restoring your home’s structural integrity and aesthetic appeal. Which begs the question, is it really possible to build a mold-resistant house? This is no hyperbole — also known as mildew in its early stages of growth, mold can be described as tiny living organisms that fall within the fungi kingdom, the same category where you’ll find yeasts and mushrooms. Like most other living things, the species has its own designated role within the natural ecosystem. As such, mold spores will always be present in the atmosphere, and there are certain conditions that provide the perfect environment for them to start growing. Mold tends to thrive in a relatively warm environment, particularly in places where temperatures range between 40 and 100 degrees Fahrenheit. This also happens to be the ideal comfortable range for human beings, which explains why a large number of homes are affected by mold growth. It’s also the reason why buildings that are kept cooler experience less mold growth. Whether it’s from a leaking faucet, steam from showers and sinks, or vapors from cooking oil, moisture provides the perfect conditions for mold spores to take root and grow quickly. Now combine this with the fact that humidity tends to rise in proportion to temperature, and it’s easy to see why bathrooms and kitchens are highly affected. It’s worth noting that humidity and moisture levels are directly linked, which translates to exponential growth in warm, humid areas. Mold cannot grow under ultraviolet light; what it prefers instead is a dark environment, which is why it tends to go unnoticed till it’s too late. Besides, an indoor area that doesn’t get much light is also likely to be poorly ventilated. In addition to promoting humidity, stagnant air also encourages growth in the sense that mold spores are able to stay in one place long enough to take root. This is by far the biggest headache homeowners face when it comes to mold removal. You see, this species feeds on organic matter, which includes just about every construction material you can imagine. In other words, food will never be much of a problem for molds growing indoors, which makes it that much harder to eliminate them completely. Basically, the difference between whether or not mold will grow in your house all comes down to how well you control these factors. So, how do you go about it? -Proper site selection: Having your house built on a site with a high water table is an effective way to eliminate moisture problems in future. Otherwise, you might need to do some landscaping to the site to keep water from getting into your home through the foundation. -Damp-proofing: This basically involves the application of a special coating on the foundation to keep out moisture. -Dry-in: This entails sealing the building envelope (including doors, windows, and roof) to prevent the penetration of water into the interior. -Ventilation: Installation of a whole-house fan, as well as proper selection of carpet and paints, are both crucial in improving indoor ventilation and, as a result, air quality. -Installing dehumidifiers during construction to eliminate new sources of moisture. All in all, the mold is a fact of life in many climates, and it’s worth mentioning that it isn’t inherently bad in all situations. This, however, doesn’t mean that you shouldn’t be concerned about having it in your living space. Fortunately, there are many effective ways to make your home mold resistant, so do whatever’s necessary to save yourself the headaches of removal and repair down the road. Mold that becomes entrenched in the house can start breaking down the house itself. As mold spreads and goes deeper into the house itself it can cause the materials to become powdery and start breaking down. This is especially true in older homes where the wood underpinning the house has not been treated for anything. As the wood absorbs water it can provide an ideal home for the mold spores to take root. As the mold takes root and the colony spreads it will break down the wood. It can also do this with drywall and other building materials, potentially causing major parts of the house to be rebuilt in order to actually cure the problem. It can also be dangerous to human and pet health, especially for those allergic to mold. As the mold builds up the number of spores in the air also increase. Even for those who are not particularly susceptible to mold, the spores can create breathing problems and other health risks. However, for those with breathing problems already the spores can exacerbate the problem from annoying to downright deadly. This can increase the amount of hospital time as well as create more severe long-term problems. Even a little mold can be deadly, but it gets worse if the mold has had time to build up. While mold can be difficult to detect directly it can be dealt with even before it becomes a problem. Even a quick inspection every season should be enough to detect most mold problems but a deeper inspection should be done after a flood, even if the home was not apparently touched. Also, a thorough inspection during summer is not a bad idea, especially if the home is in an area with extreme humidity. Another time to do a quick inspection is if anyone is having an unexplained breathing problem, especially if they are known to have mold allergies. If mold is found it can be dealt with. For a small infestation, it may be time to break out the bleach and some scrubbing sponges; a few hours of work can take care of most infestations quickly and with little fuss. If there is anything more severe then it may be time to call in a decent contractor. However, considering how much damage even a medium infestation can do it can only help to know the number of a decent mold removal company such as Precision Mold Removal. Keep in mind that severe infestations require severe solutions. The repairs can get really expensive really quickly, and that is just considering the costs to remove the mold and repair the home. It does not include the possible hotel and hospital stays as the mold is dealt with, or even the long-term health costs after the problem has been dealt with. You need to try and deal with the problem when it can be dealt with, and not when it does become a major problem. This is a situation where it can only help to be proactive, and the more you worry about it the better. A little bit of worry may actually be a good thing if it prevents a mold issue. This is why it helps to know companies like Precision Mold Removal . They can quickly detect a mold problem and have a general idea just how bad the problem is. They can also inspect the property and determine how widespread the problem and determine what it will take to eliminate the problem. They can also give you an estimate of the cost and a general idea of just how long it will take to fix the problem. It is just a matter of contacting them and setting up an appointment. The sooner you do that, the better you will feel. It is your home, and you do deserve a home free from mold.